Today’s New York Times ran an op-ed about human hubris and the climate crisis we now face. I use the word “hubris” a great deal in my literary studies classes, too. Many a protagonist, good or bad, gets felled by this fatal flaw of overweening pride. I have never checked a dictionary for our word, so let’s see how I did. Though the Greek original is ancient, this loan word dates only to the late Victorian era. The OED Online gives a few usages, all of them about the same of “presumption toward the gods, self-confidence, pride.” the lack of nuance after the first definition surprises me. Mere pride is not a vice. One can and should be proud of one’s accomplishments and those of others (envy being another fatal flaw). Hubris is a certain type of pride, however, and in the Miltonic Satan’s will to challenge the Almighty we hear echoes of many earlier myths of mortals who dared to compare their beauty, strength, or courage to the immortals of Olympus. So beware hubris. It’s everywhere these days. It always comes before a fall. 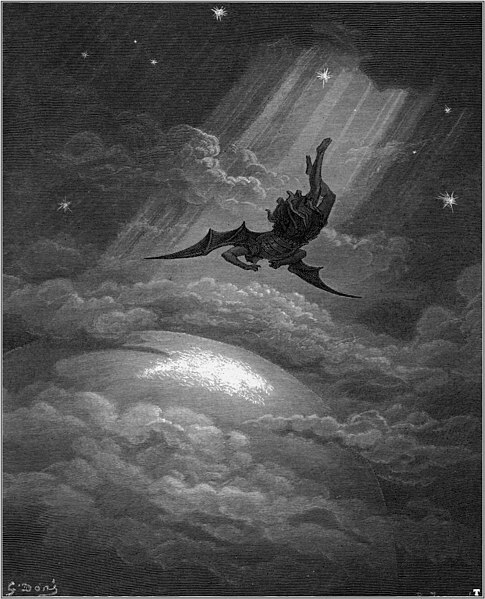 Gustav Doré’s illustration from Paradise Lost comes to us courtesy of Wikipedia Commons.